In addition to the sensationalist murder accounts, De Wolfe looks back at these events through a wide-angle lens exploring such themes as the rapid social changes brought about by urbanization and industrialization in antebellum nineteenth-century society, factory work and the changing roles for women, unregulated sexuality and the specter of abortion, and the sentimental novel as a guidebook. She posits that the real threat to women in the nineteenth century was not murder but a society that had ambiguous feelings about the role of women in the economic system, in education, and as independent citizens. 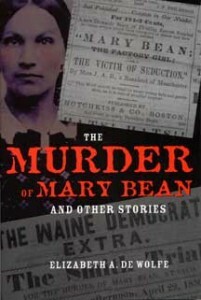 Sure to place this case among the classics of crime literature, The Murder of Mary Bean and Other Stories features two reprinted accounts of Caswell’s death, both fictional and originally printed in the 1850s, as well as an introduction that places these salacious accounts in a historical context. This book serves not simply as true crime but, rather, presents a seamy side of rapid industrial growth and the public anxiety over the emerging economic roles of women. Elizabeth A. De Wolfe is associate professor of history at the University of New England in Biddeford, Maine. 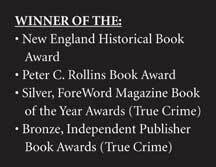 She is coeditor (with Thomas S. Edwards) of Such News of the Land: U.S. Women Nature Writers (2001) and the author of Shaking the Faith: Women, Family and Mary Marshall Dyer’s Anti-Shaker Campaign, 1815–1867 (2002), which received the 2003 Outstanding Publication Award from the Communal Studies Association.